This narrow oval Nantucket Lightship basket features a cherry wood base, cane staves and extra fine cane weaving, with traditional Nantucket basket dyed rattan reed rims. 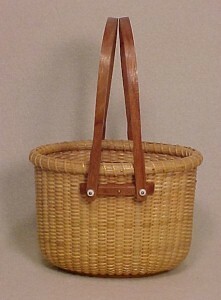 A contemporary new Nantucket basketry design element is the off-set double-drop carved cherry wood handles, attached with bone basketry knobs and brass washers on the sides of the basket, rather than the the rims, as is more common and traditional. The cherry off-sets, which are chamfered on the ends are sanded smooth, are then cut shaped to fit precisely to the sides of the Nantucket basket, securely nailed both inside and out. This new Nantucket basket design allows the handles to by-pass the traditionally nailed and lashed rims without rubbing, and gives this basket a much more contemporary design look. This unique and stunningly different Nantucket basket measures 6" long x 4" wide (not including the off-sets), 4.25" high to the rims and 8.75" high to the top of the handles. Although I am no longer accepting orders for the Tall Oval Offset Nantucket Basket, I may craft a few of these per year. When available for sale, you can purchase it directly from my Simply Baskets website.